Ten years ago, Sea and Shore Services was launched in the port of Rotterdam: an all-round service provider focusing on container flows between Europe, Asia and the United States. Today, the company employees 34, has 25,000 containers and 500 tonnes of air cargo transported annually and fully takes care of all the logistics needs of customers. The management of Sea and Shore Services consists of general manager Kees Moolenaar and operational director Dennis de Ruiter, the two founders of the company, and commercial director Dimitri van Bekkum. According to them, their company provides the most efficient solutions for transporting large volumes from A to B. Van Bekkum: “We use all the modes of transport necessary for this. By smartly combining container flows, we can improve efficiency for our customers. One of our strengths is that we have a good balance between imports and exports, which are almost equal in terms of volumes. This enables us to limit the number of empty kilometres and carry out transport more cost efficiently”. Sea and Shore Services works for many different clients in various sectors. DeRuiter. “We are AEO-certified and as a member of the board of the Global Alliance play a prominent role within this global international network of freight forwarders. Furthermore, we are continuously looking for nice markets. One example of this is the overseas transport of complex goods such as recyclables and disposables, both dangerous and harmless (including the entire process regarding environmental compliance). In this respect, we aim to always transport cargo sustainably”. Besides the port of Rotterdam, Sea and Shore Services also operates in Moerdijk and in Amsterdam with warehousing and logistics services; the warehouse in Amsterdam spans 17,000m2. Warehousing is one of the new focal points of the company. Moolenaar: “Some customers are looking for a logistics partner to take on their entire logistics needs at a fixed price per pallet or product. We want to accommodate them in this. We offer storage, cross docking and value-added logistics, while at the same time we can perform highly localised distribution as well. Customers who use us for this can fully focus on their core business”. 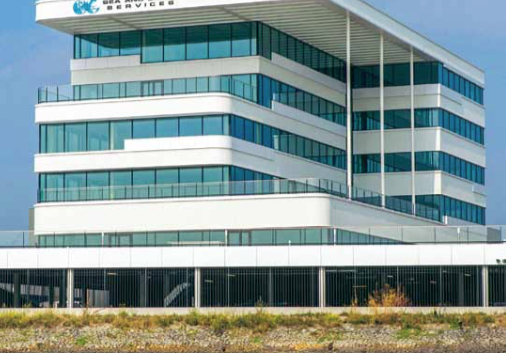 Since half a year, Sea and Shore Services has been located in a new building in Schiedam. The panoramic view of the Nieuwe Maas River symbolises the new phase which the company has now embarked upon one decade after its inception. Van Bekkum: “We are a flat organisation with a one-stop shopping concept, short lines of communication with the customer and dedicated account managers for large customers. That will not change. In the coming years, we aim to grow, handle larger volumes and add more logistics hotspots that offer the same high service levels”.